Those pesky pregnancy rumors won’t leave Cardi B alone! And on Wednesday, the Grammy nominated artist added more fuel to the fire. 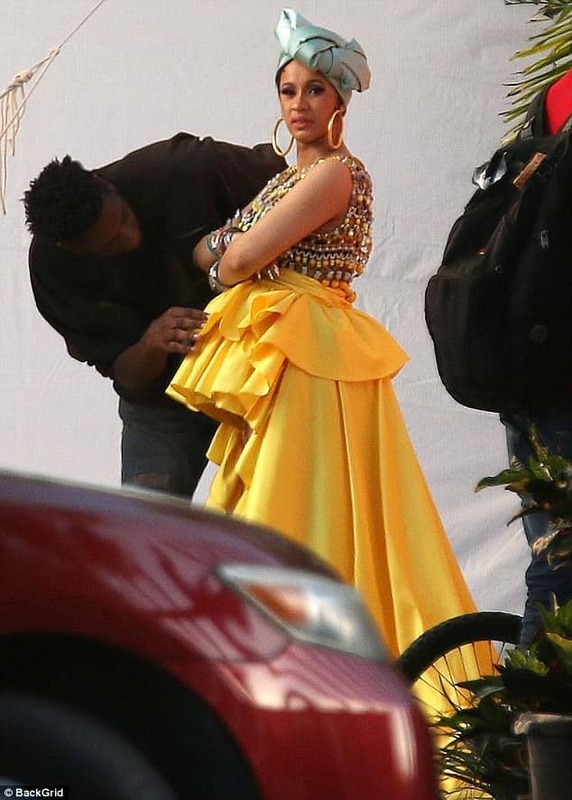 She was pictured covering her stomach with a yellow ruffled skirt on the set of her latest music video. The 25-year-old former reality star, stunned in the bright color and teamed up her look with a beaded top and a light blue head scarf. 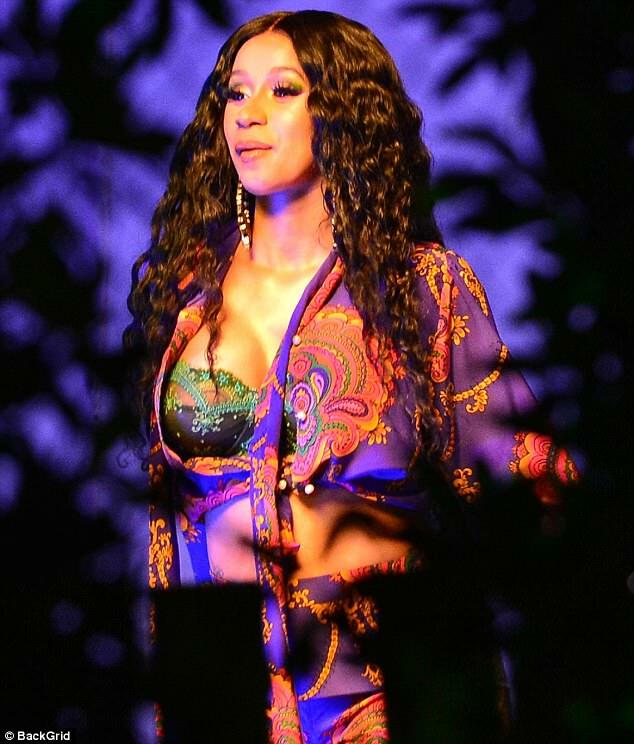 The Bodak Yellow rapper was filming her newest single off her upcoming album Invasion Of Privacy. 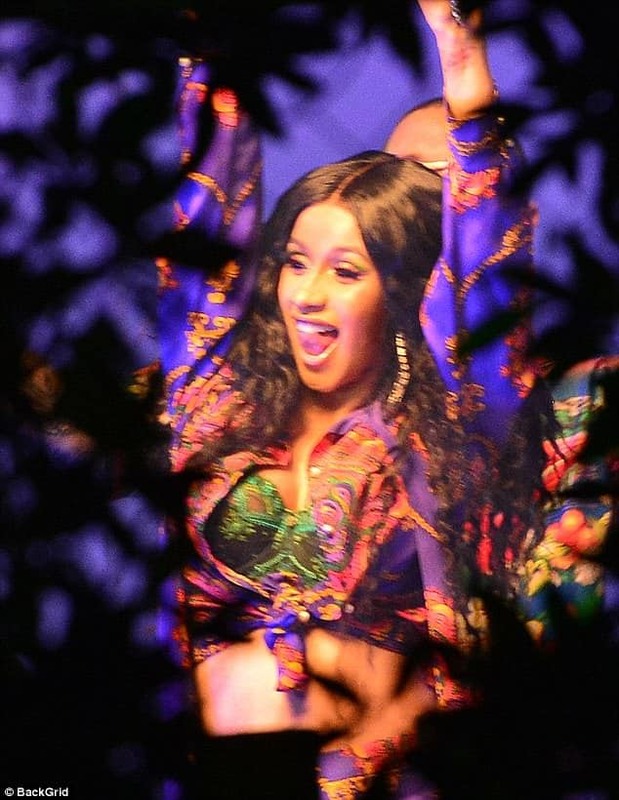 Paying homage to salsa queen Celia Cruz, Cardi looked sensational as she rocked large hoop earrings and a collection of bracelets on her wrists. Cardi’s new track also features J Balvin and Bad Bunny who were on the video set on Wednesday. The former Love & Hip Hop star has been dodging rumors she is expecting her first child with fiancé Offset. Last month, TMZ reported that members of the rapper’s team revealed that she was pregnant during Super Bowl weekend. According to TMZ, after Cardi performed at Maxim’s bash, a member of her team said that she didn’t want to be in the ‘party atmosphere’ of the VIP room. This because her client is ‘three to four months’ pregnant. 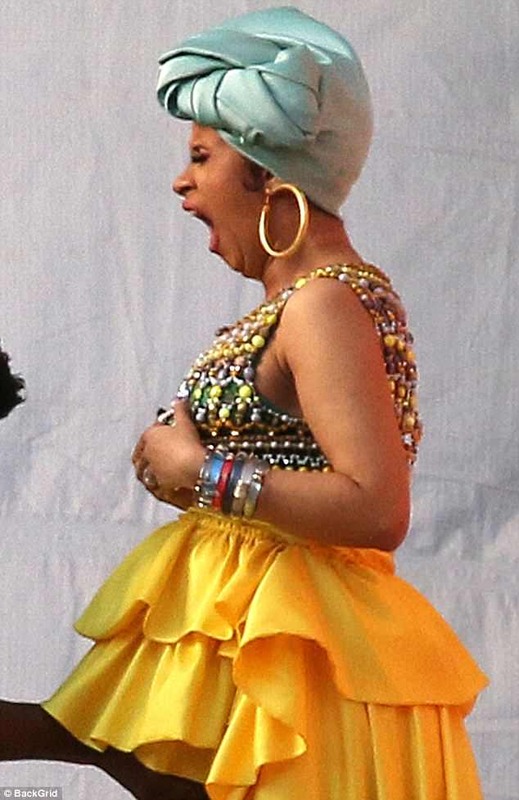 Since then Cardi has gone to suspiciously great lengths to cover up her alleged growing midsection. 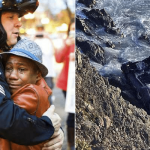 On Wednesday, the beauty was photographed with her arms crossed over her belly multiple times. Her stylist also seemed to be giving a lot of extra attention to her stomach, as he fixed the layers of ruffles on the top section of the skirt. The usually outspoken star hasn’t responded to ongoing pregnancy rumors in recent weeks, despite initially shooting down speculation. ‘Is there maybe a Kylie Jenner secret that we need to know about lol Just asking,’ referring to the 20-year-old reality TV star, who declined to publicly confirm her recent pregnancy. Cardi also denied the rumors during a red carpet interview with E! News at January’s Grammy Awards, saying that she faces pregnancy talk ‘every two weeks’. Cardi’s fans are anxiously awaiting her debut studio album, Invasion of Privacy, which drops on April 6. She’s also set to take the stage at Coachella at the end of April. If the rapper is pregnant, she would be about seven months along when she performs at the music festival. Previous article Chris Brown Grips Hands Around Woman’s Neck – Both Say It Was Playful – You Be The Judge!